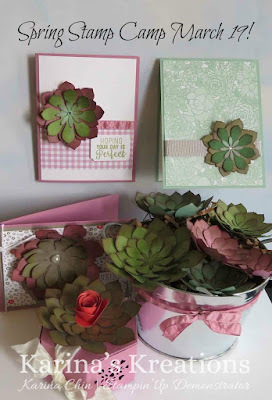 Karina's Kreations: Spring Stamp Camp! These are the projects we'll be making on March 19 from 1:00-4:00! You will get 1/2 a Vertical Gardens project kit and all the supplies to make these 3 cards and two 3-D items. I'm also offering this class as a kit to go to make in your own home. The cost is $35.00 or $5.00 and a minimum order. I would love to be a swap sister! Let me know everything I need to know. Thank you for asking. HI Gloria, email me at kchin2@telus.net and I can give you more information!